What’s more, windbreaks planted around your farm buildings and home can reduce heating costs up to 30 per cent! Figure 1. 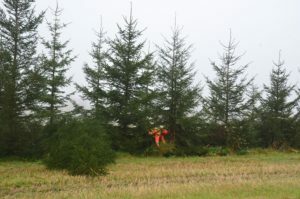 Thinning a windbreak using a staggered pattern. The Ministry of Agriculture, Food and Rural Affairs (OMAFRA) has many resources to help you with windbreak planning. Visit our website to watch four windbreak videos on planning, planting, maintenance and farmer windbreak success stories. 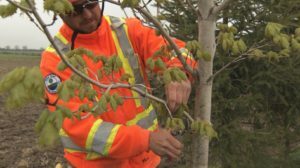 Our free Best Management Practices book, “Establishing Tree Cover,” provides a step-by-step guide for planning and planting a windbreak and includes maintenance tips. Contact OMAFRA’s Agricultural Information Contact Centre at 1-877-424-1300 or ag.info.omafra@ontario.ca for more information.